Information device “FACT TK” for the seeders. Help to eliminate violations of seeding, prolong the life of a seeder, save seeds, reduce the terms and increase productivity. - The only enterprise in the entire post-Soviet world, which makes its own developments for IT supporting of planting farming machinery. August - the month of preferential prices. Start the preparations for the future crops wth us. We have ENOUGH PARTS AND DEVICES for you. Our company is all about the thing, which has been living for more than thirty years already. A group of enthusiasts from two Poltava universities began to create seed metering devices. 1997. V. Rudenko proposed a new quality assessing criteria for the field inspection in correlation with the speed of seeder (doubles, blanks) that opened new approaches in the global community of farming machinery manufacturers and farmers themselves. Rudenko peremptorily adds to his approach another "Poltava technology" of sowing rows, which allows to optimally determine the maximum speed of specific aggregate on a particular field at the highest possible planting quality. Looking ahead: manufacturers of agricultural equipment in all over the world silently accepted Rudenko paradigm. Ukrainian one. 2004. A private company “Rudenko” is created. From this year, "Poltava engineering group Ltd" and Private Company "Rudenko" both headed by Rudenko V.P. released the Seed Control System "NIVA 23". 2006. In two years, private enterprise "Rudenko" awarded the diploma of the National Award “Vyshcha Proba”, and all of its products won the right to be signed with such an honored marking. 2006. Private enterprise "Rudenko" awarded a diploma and a medal of National business ratings in the "Industry Leader" category. 2008. Ten years of the Seed Control System “NIVA 23” releasing by "Poltava engineering team Ltd". Ten years changed the world's view on the seed quality assessment and accepted the Rudenko suggestion. 2009. A "Rudenko" enterprise completed the development of information devices for the seed control systems named “FACT”. 2009. The first five years of seed control systems manufacturing in "Rudenko" company. The CEO was marked with highly honored "Platinum medal" in the category "Zoloti ruky krayiny" (“Gold Hands of Ukraine”). 2010. The Seed Control System "NIVA 23" is deleted from the production. In its place, the company put "Information Device FACT TK” for the row crops and "FACT KK" for the indirect control of grains. “Information Device FACT TK” is available for 15 types of seeders from different countries manufacturers. It is produced on request for seeders from Europe, the US and other countries. 2012.V. Rudenko receives the highest award "Diamond medal" in the category "Zoloti ruky krayiny" (“Gold Hands of Ukraine”). 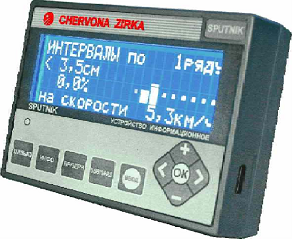 PJSC "Chervona Zirka" in Kirovograd decides to raise the technical level of row crop planters by equipping their devices by "FACT" of "Rudenko". “Information Device FACT” improved all seeders on the plant. 2013. The "Rudenko" enterprise completed the development of new updated series of “FACT”. Members of "Poltava engineering group Ltd" decided to join the Private Company "Rudenko". 2014. The mass production of three following models: "FACT" - budget; "FACT" - USB (data transferring to the PC); "FACT" - GPRS (seeding control from the office). 2015. Production of the spare parts for previous models. What is the novelty of your seed control systems and information devices in comparison with similar units from foreign suppliers? For the first time in the world (1997) a control of the distances between adjacent seeds within a row was added to the technological values that must be mandatory inspected during planting. It was proposed by one of the “Niva 23” authors V.P. Rudenko, as mandatory information for machine operators and agronomist to deal with doubles and blanks. As exceptional when setting up and performing seeding rather than in analysis and evaluation of the sowing machines at their trials. Then, for the first time in the world the input data of seed control systems, specifically "Niva 23", was expanded by the compulsory screen of "histogram distances between seeds", "doubles" and "blanks" with numerical and schematic displaying. This is the main difference. P.S. The innovation was criticized. But... For example, in "John Deere" stayed this way after 10 years. It is nice, wishing them success. As always, there was also a rip-off. However, as V. Rudenko says, the words cannot be throw of the song, but we still have many things in our bag. WE ARE UNIQUE: A NEW BRAND NAME BY Rudenko V. P. is based on the new technical possibilities, better approaches to obtaining the information. Now the operator can perform more accurate seeder’s settings, but for higher speeds and, keeping crop quality, implement it in a shorter time at lower cost. Information device “FACT TK” for the row crop seeders. on the results of seeding for each sowing unit of seeders over the entire area of the field and total seeding result. in process of seeding, on the basis of comprehensive text and audio information, the operator understands exactly where the seeding quality falls, and what are the obstacles for normal seeds distribution. PRODUCING. Monitor body is made of highly durable plastic. Seeding capacitive indicators, motion sensor - inductive or bases on Hall Effect. Power supply of the control system is 12B. "FACT", the basic version, is equipped with number of sensors for seeders’ configuration (up to 24 pcs. ), motion sensors, and spare parts. "FACT", special ones, may additionally have two level indicators (one for seed and one for fertilizer). Seeding sensors that are made of stainless steel and are located mainly in the coulters have special design according to a particular seeder. WARRANTY PERIOD - TWO PLANTING SEASONS. The monitor with a cable. Sensors of seeding – according to number of rows seeder has plus one spare unit. The motion sensor. A bracket for the motion sensor fixing. Details for monitor fixing in the tractor’s cabin. A cabling for wiring distribution of the seeder with a plug. Details for connector attachment on the seeder frame. Belt for assembling the wires on the frame of a seeder. Screws. Instructions for device installation and operation. The first variant – a budget model. It is a new LCD. Modern wiring. The new scheme of sensor-based microcontroller. Optical indicators in the family of sensors. 2. The second option - budget one + USB output for transferring data to a computer. 3. The third option - budget model + GPRS for access to the information from the monitor installed in tractor cab. - Helps to eliminate violations of seeding. - Makes it possible to guarantee the quality of the crop. - Attends to prolong the life of the seeder. - Defends the honor of mechanic and farmer. - Guarantees the full payback on 10-15 hectares. - SOLID SAVING OF SEEDS. - REDUCTION OF SOWING TERMS. - SAVING OF FUELS AND LUBRICANTS. - REDUCING THE EXPENCES ON CROPS CARING. - CONFIDENCE, ACCURATE REPORTING AND ACCOUNTING. We are taking orders for the development of devices. Over the past 15 years of operation, we can confidently say that "Poltava seeding technology" has taught many sowers to determine in optimal way the maximum speed of their crop seeders. As a rule, these speeds are always higher than the usual rate, thus bring productivity and cost savings for smart farmers and agricultures. Our company produces only the information device "FACT". We look forward to mutually beneficial cooperation! If you have technical or commercial issues, please contact us, we are happy to answer!